UPDATE: Former vice president Joe Biden will speak at a rally for striking Stop & Shop union workers Thursday in Dorchester. The rally is scheduled for 2 p.m. at South Bay. Wednesday marks day seven of the Stop & Shop workers strike. Last Thursday, United Food & Commercial Workers Local 1445 members who work at Stop & Shop officially walked off their jobs. The strike began after the union and company failed to come to an agreement on their contract. The workers are fighting for living wages, pensions, better healthcare and want to negotiate a fair contract. 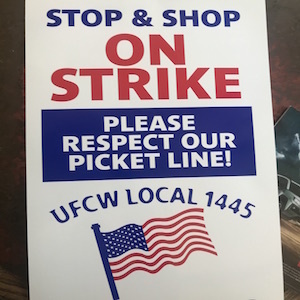 Nearly 31,000 employees in Massachusetts, Connecticut and Rhode Island from about 200 New England stores are picketing and there seems to be no end in sight. Looks like we’ll be shopping at Star and Whole Foods. We encourage you to show your support to the Stop & Shop workers by doing the same. Also give them a wave or beep your car horn when you pass by!